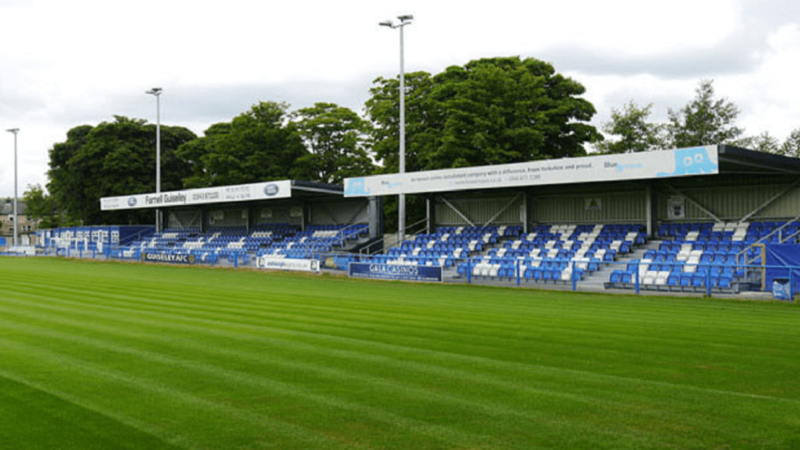 Here is the Talking Bull Away Guide to Guiseley ahead of the re-scheduled Hereford FC fixture at Nethermoor Park. We’re on our way to somewhere. We’ve no idea where we’re going, but we’re going to enjoy it. Guiseley is prime ecky-thump country, being a suburb of Leeds with a population of 22,000. Its best known as the home of the original Harry Ramsdens restaurant (see below) and the birthplace of Harry Corbett, the man behind Sooty and Sweep (our younger readers may need to consult their parents at this point). Guiseley is high up in the Aire Valley. Our hosts were relegated from the National League after two years of struggle. They are a small club without a benefactor and found the going hard. A brief experimental switch to full-time wasn’t successful and was quickly abandoned. The ground has similarities to Brackley, being rather basic and rather open. Ideal for December. The 500 seats are located along one touchline, split between two small modern stands. Opposite a small covered terrace, which again is located towards the Railway End. Segregation is rarely enforced and given our small numbers, I feel its unlikely we’ll be cut off from the Tykes. Both ends have open terracing. Expect to pay adults £13, concessions £9, Under18’s £5, Under 11’s £1. If any Disabulls travel, Guiseley offer designated parking, wheelchair spaces in the main stand, accessible stands and free entry for carers/ assistants. Contact trudi.hannaford@guiseleyafc.co.uk to book parking. The Clubhouse is situated within the ground and promise “lots of real ale”. The building is shared with the Cricket club last year. The nearest alternative is a ten-minute walk from the ground along Otley Road (towards centre of Guiseley) is Coopers. This CAMRA pub has eight real ales on tap. These will include a Timothy Taylor’s, a Roosters and a Okell’s beer as well as a real cider and a dark beer are always available with 5 guest beers. Coopers is handy for the station. A couple of places for the hungry. Firstly, head in the town centre along Otley Road for the Station restaurant. This is a bar with excellent pizza, according to Tripadvisor. As the name suggests, handy for the station. Alternatively, head in the opposite direction along Otley Road is the Wetherby Whaler. This establishment was the original Harry Ramsdens before it was sold. Tripadvisor rates it as the second-best restaurant in the town. Unlike Ramsdens, the Whaler has an extensive veggie menu. Not cheap and Christmas may mean table shortages. By Road: (LS20 8BT) 385 miles (fifth longest). Leave M62 at J28 and take A653 towards Leeds. After passing the White Rose Shopping Centre, bear left where the road forks onto the ring road (A6110). Continue on the A6110 following signs for Bradford (A647). Follow ring road for 8 miles, until at roundabout, take first exit onto the A65 towards Skipton. Continue on A65 for four miles and Nethermoor Park is on the right. By Train: Possible from the Shire. Looking at 5 hours each way (similar to driving time), though changing at New St and Leeds is a nuisance. Ground is handily five minutes’ flat walk from Guiseley station. For rest of the country, Guiseley is very well served on the Wharfedale Line by trains from Leeds. By Plane: Leeds/ Bradford airport is nearby.